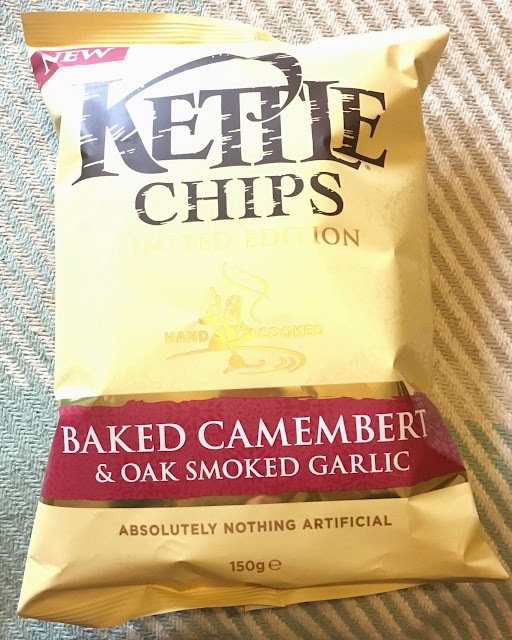 This new and limited edition crisps flavour from Kettle Chips sounded like it would be quite a punchy variety, and a great alternative to tradition cheese and onion crisps. Essentially they upped the cheese to a stronger camembert and the onion to smoked garlic. I couldn’t wait! I opened up the bag and was a little disappointed to find that the aroma was quite mild, barely cheesy at all if I’m honest. Baked Camembert with crusty bread is one of my favourite starters in a restaurant, and I love that the cheese normally has such a strong, but creamy, flavour. I tried one of these crisps and found them a bit nondescript. They were mildly cheesy, and I couldn’t pick up on garlic very much, never the distinction of it being oak smoked. Their mild taste meant that they were easy to eat, and not a flavour that would put anyone off. If you are sharing with friends this might be a blessing. Connoisseurs wanting a strong Camembert flavour, dripping in smokey garlic might just go and dip these into a proper camembert cheese to enhance the taste.